Some clouds. Low 42F. Winds NNW at 15 to 25 mph.. RIGHT: The Snooze Bangkok Bloody Mary and Breakfast Pot Pie are pictured. The Denver-based chain will open a northern Colorado Springs location April 24. 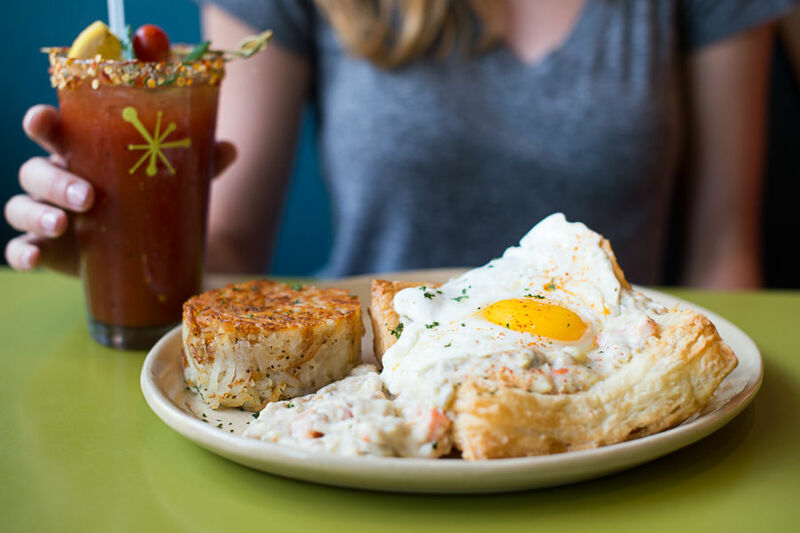 The Snooze Bangkok Bloody Mary and Breakfast Pot Pie are pictured. The Denver-based chain will open a northern Colorado Springs location April 24. Snooze, the popular breakfast and brunch restaurant, will open a restaurant April 24 at 7587 N. Academy Boulevard, Suite 120, on the corner of N. Academy Boulevard and Agora Point. Known for its fun, whimsical breakfasts and entertaining atmosphere, Snooze is a popular morning dining staple for many Coloradans. Since opening in 2006, Snooze’s popularity has grown, with local residents requesting the eatery open a Colorado Springs location. According to Snooze Communications Manager Becky Fairchild, Snooze was happy to grant customers their request. It’s their entertaining, flavorful foodstuff that put Snooze on the morning eatery map. Chile Verde Benny, Juan’s Breakfast Tacos and Pineapple Upside Down Pancakes offer a whimsical twist to these popular dishes, and their Smashed Avocado Benny, an English muffin smothered in green chili and smashed avocado, also is a visual treat. A myriad of beverages, like the Dirty Drunken Chai, Morning Marg and Rummmosa highlight the morning cocktail menu. Breakfast burritos and tacos, and egg and pancake meals are among the standard dish items. Founded by Jon and Adam Schlegel, Snooze has restaurants in Boulder and Fort Collins, as well as in Arizona, California and Texas. With each new location Snooze establishes, the eatery seeks to enhance the environment by planting one tree per employee at its partner Godoy coffee farm in Guatemala. Snooze seeks to plant 2,100 trees on Earth Day, which is Monday. For its pre-opening benefit breakfast, Snooze is partnering with Catamount Institute, Colorado Springs Food Rescue, and Home Front Cares to raise money and support with the community and neighbors. Snooze also celebrates special holidays as a way to give back to the community. For National Pancake Day, Snooze donates 100 percent of its pancake sales to local community gardens, and participates in planting, weeding and mowing chores, Fairchild said. “This Snooze is really special as it’s our first location in this market. The Colorado Springs community has been traveling into Denver to enjoy our (food) for some time now, so to answer their requests for a new location makes us very happy,” Fairchild said. “We do not just open in a community, but with the community.